After leaving the monastery, I had a long, bumpy ride back to Kathmandu and then flew to Pokhara in an impossibly small plane that was just as bumpy as the car. I originally planned to stay in Pokhara for only three days and then return to Kathmandu, but then I discovered that the Unified Maoist party—one of Nepal’s more contentious political parties—called a three-day nationwide bandh, which is a strike intended to be a protest against the government’s ruling party. 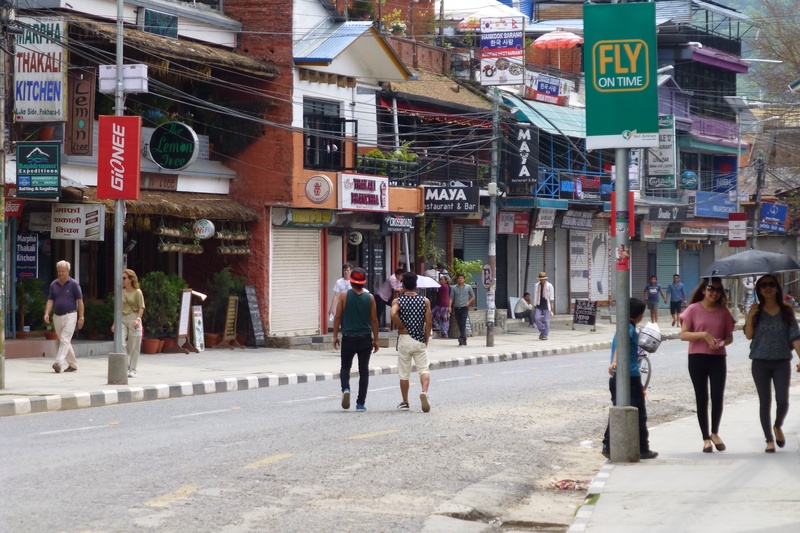 Although the bandh is enforced throughout the country, Kathmandu is most affected because it’s the capital and also the likely location of any political protests that come with the bandh. Apparently, scores of unemployed Nepalese are often hired as bandh enforcers and the combination of them, plus anti-government protesters, plus anti-bandh protesters has been known to be a very caustic mix. All that said, I decided to extend my stay in Pokhara to wait out the bulk of the bandh. So, here I am in Pokhara for a bit longer than intended, which is not so bad considering its location. 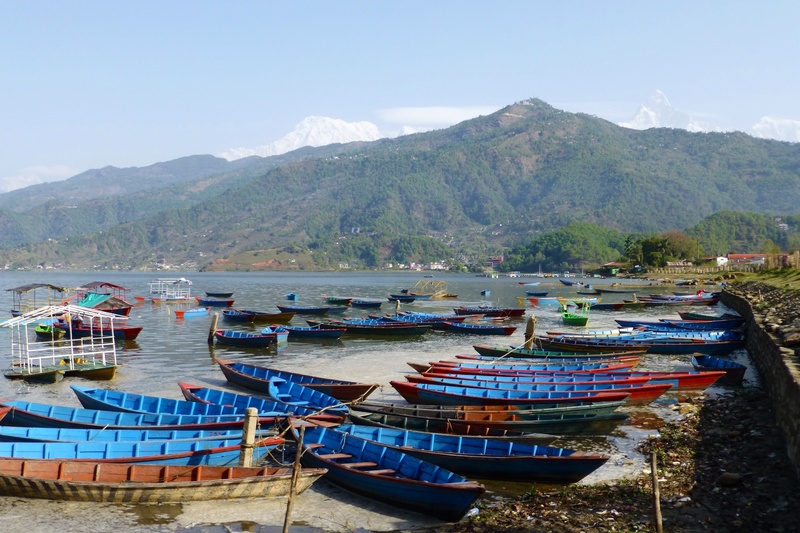 Pokhara is best known for Phewa Lake, which is Nepal’s second largest. 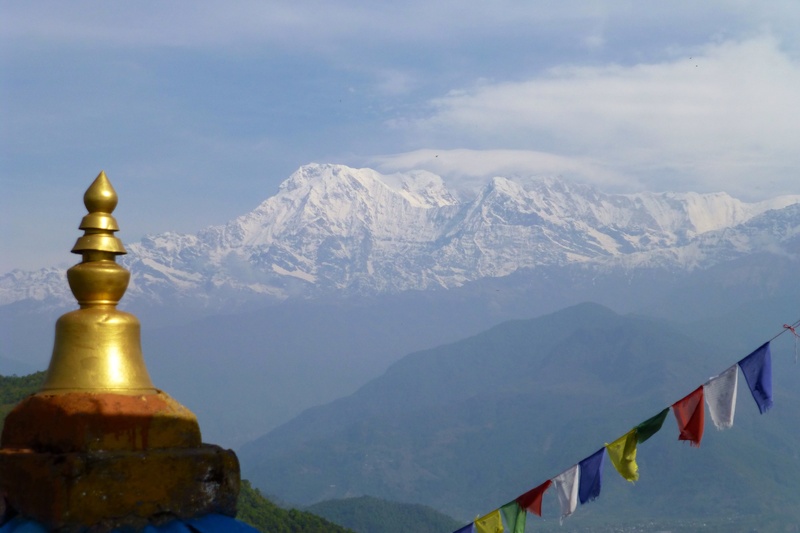 It’s also a place where trekkers begin or end their Annapurna treks, so it has a nice, lazy backpacker feel while also providing numerous day hikes that offer fantastic views of Machhupachhure (Fishtail mountain) and Annapurna II. In other words, it’s not a bad place to be stranded because I can occupy myself by prepping for my trek. Speaking of which, I’ve been informed that the trek may not happen because of consistently poor weather conditions over the last few weeks (two trekkers died in an avalanche just a few weeks ago). So, even though I plan to spend my time in Pokhara preparing myself physically for my trek, I’m also preparing myself mentally for the possibility that it won’t happen. Ah, the joys of travel…so many surprises to keep you on your toes. Day 1: Getting settled, shopping, and treating myself to a decent coffee. Not necessarily in that order. Day 2: Hike to the World Peace Pagoda (which is not a pagoda at all, but a Buddhist stupa) on the forested side of the lake. I took a ferry across Phewa Lake to start the hike at the base of the hill, then climbed to the top via many, many roughly hewn steps (dear god, what’s up with all the stairs?). According to my calculations, it’s a 1700+ ft elevation gain, but that doesn’t feel quite right to me—or perhaps all my stair climbing at the monastery has just made it easier. 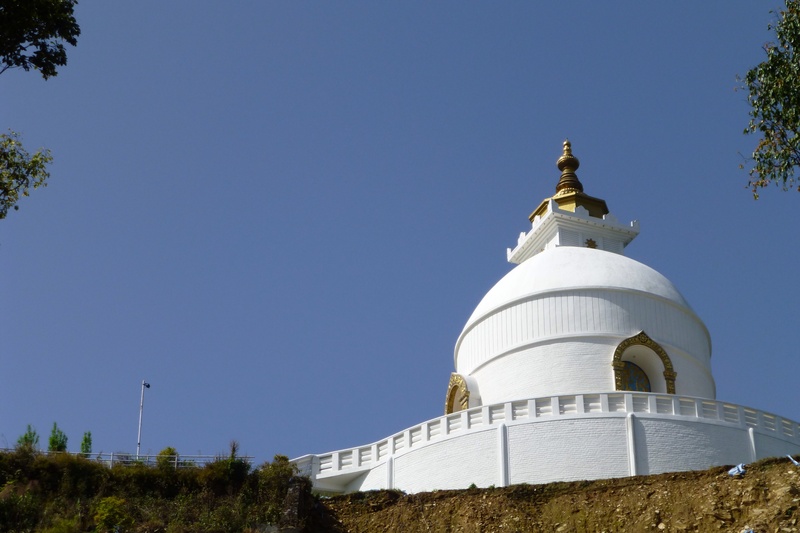 After reaching the top and circumnavigating the stupa several times (out of respect for the stupa and Buddhism in general), I then opted to hike back to town rather than ferry back, which made for a fairly lengthy hike. Day 3: Planned to hike to Sarangkot, but my plans were thwarted by ‘ye olde traveler’s malady.’ I wasn’t too badly off, so I simply modified my hike to something nearer to civilization. That said, I walked to Devi’s Falls (so named after a Swiss tourist who fell in, or so they say) and the Mahadev Cave (a cave revered by Hindus), then back to town again. Afterward, I treated myself to a much-needed pedicure to attend to the callouses that have built up from a month of wearing hiking sandals. Not too shabby for a sick day. A very quiet Pokhara during the bandha…no cars. Day 4: The bandh officially begins and already there are reports of protests, vandalism, and arson in Kathmandu. I’m so glad I opted to stay in Pokhara—although everything is mostly closed here, it’s quiet and there’s still enough open to keep a person fed and coffee’d, which isn’t the case in Kathmandu (or so I hear). Today I caught a ride with the hotel taxi (the only kind allowed to run during the strike) to the base of Sarangkot, then climbed to the top via even more of those bloody stairs (I planned to count them, but found it impossible because they start and stop. I lost count in the 500s…which was long before I reached the top). If the Annapurna Circuit is made up entirely of stairs, then I might as well pack my things and come home because I’m soooo over the stairs. Once I reached the top I was rewarded for my efforts by some truly sublime mountain views, then made my way back to town via a different, steeper, and more rugged trail (which also had steps, of course). Curious how my knees will feel in the morning. Day 5: Things are looking up…not only are my knees just fine, but it sounds like the political parties are seeing a bit of reason and acknowledging that the bandh hurts the Nepalese more than it does the government, so it’s been called off… after a day of many protests and 46 arrests. So, today I return to Kathmandu via that ridiculously small, bumpy plane (but this time equipped with motion sickness pills). There will be just enough time to do some last-minute sightseeing and preparations before David arrives for the trek on the 10th. I should know by tomorrow whether the trek is on. Fingers crossed! Good luck on the trek happening and if it does, Best of luck that it’s a safe one! Thanks, I hope it does too (and that it’s safe)!